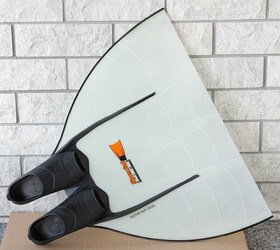 Monofin 'Dolphin' FRD ' with closed heel Mares Razor foot pockets . Hand tapered blade from fiberglass makes blade very flexible. It is mostly used for finswimming, underwater orientation, freediving (especially for dynamic events) and long distance swimming. Standard measures are 72 cm x 66 cm (width x length). Monofin 'Dolphin' FRD has rubber ribs. We recommend a 'Dolphin' FRD because of the comfortable foot pockets. Mares Razor footpockets will allow you to practice a long,long hours.